There's now a wireless, vertical Pro-Ject turntable | What Hi-Fi? The VT-E BT comes in red, white, and black, and is priced at £380. It's Bluetooth connected, and can be hung on your wall or mounted to a shelf. Pro-ject's vertical, plug-and-play turntable is now available with Bluetooth compatibility. The VT-E BT, which follows the release of the VT-E, is priced at £380 - approximately £100 more than the wired version. If you don't feel like using the Bluetooth settings all the time, you can still connect it up via the supplied cable to your hi-fi system. 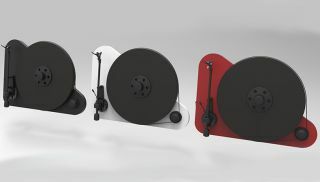 Apart from that, it has all the same qualities as the original VT-E: it comes in right- and left-handed varieties, and can be mounted on a desk or wall, and is currently available in red, white, and black.